The mallard was domesticated in China some 3,000 years ago, and possibly much earlier. :121:3 Force-feeding of ducks is documented from the tenth century, under the Five Dynasties. :593 The Chinese were sophisticated breeders of ducks;:92 among several breeds they created was one named shi-chin-ya-tze, which roughly translates to "ten-pound duck", from which the American Pekin derives. In 1872, James E. Palmer of Stonington, Connecticut, loaded fifteen white ducks of this type for shipment to a businessman named McGrath in the United States. The birds were loaded at Shanghai but had been hatched in Peking (now called Beijing). Nine of them – six hens and three drakes – survived the voyage, which took 124 days and reached New York City on 13 March 1873.:92 Five of the surviving birds were dispatched to McGrath but were eaten before they reached him. Palmer's four birds became the foundation stock of the American Pekin; by July 1873, his three hens had laid more than three hundred eggs. In 1874, the Pekin was included in the first edition of the Standard of Perfection published by the new American Poultry Association. :92 It was soon in widespread production for slaughter. :92 Until that time, a popular breed raised for meat had been the Cayuga, which had the disadvantage of dark feathering, so that any fluff remaining on the carcass was easily seen; the white-feathered Pekin was preferable. Other birds of the same type were imported to the United Kingdom in 1872 and from there soon reached Germany, where they gave rise to the German Pekin, a distinct and separate breed. 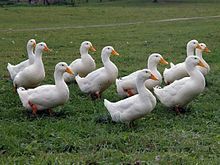 In Germany, the Chinese ducks were cross-bred with upright white ducks brought from Japan by Dutch ships, resulting in birds with a steep body angle; those taken to the United States were crossed with birds of the British Aylesbury breed, which led to birds with a more horizontal stance. The Pekin in the United Kingdom derives from birds imported from Germany from about 1970. ^ Barbara Rischkowsky, D. Pilling (eds.) (2007). List of breeds documented in the Global Databank for Animal Genetic Resources,[dead link] annex to The State of the World's Animal Genetic Resources for Food and Agriculture. [dead link] Rome: Food and Agriculture Organization of the United Nations. ISBN 9789251057629. Accessed February 2017. Also on CD-ROM. ^ a b c d e f g h i j k l Dave Holderread (2011). Storey's Guide to Raising Ducks, second edition. North Adams, Massachusetts: Storey Publishing. ISBN 9781603427456. ^ Breed Classification. Poultry Club of Great Britain. Archived 12 June 2018. ^ a b Transboundary breed: Pekin. Domestic Animal Diversity Information System of the Food and Agriculture Organization of the United Nations. Accessed February 2017. ^ Transboundary breed: White Pekin. Domestic Animal Diversity Information System of the Food and Agriculture Organization of the United Nations. Accessed February 2017. ^ a b c d Kenneth Broekman (December 2009). 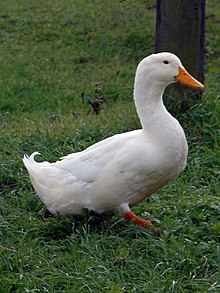 The German Pekin Duck. Aviculture Europe. 5 (6), article 12. Accessed February 2017. ^ [s.n.] (1999). Food Arts, volume 12. Food Arts Incorporated. ^ Wolf Herre, Manfred Röhrs (2013). Haustiere - zoologisch gesehen, second edition (in German). Berlin; Heidelberg: Springer Spektrum. ISBN 9783642393938. doi:10.1007/978-3-642-39394-5. ^ Peter Cherry, Trevor Raymond Morris (2008). Domestic Duck Production: Science and Practice. Wallingford, Oxfordshire: CABI. ISBN 9781845934415. ^ Alan Davidson (1999). The Oxford Companion to Food. Oxford: Oxford University Press. ISBN 9780192115799. ^ [s.n.] (February 1880). Pekin Ducks The Pet Stock Pigeon and Poultry Bulletin 10 (11): 1. ^ a b c Chris Ashton, Mike Ashton (2001). The Domestic Duck. Ramsbury, Marlborough: The Crowood Press. ISBN 9781847979704. ^ a b c d Paul-Erwin Oswald (2004). Amerikanische Pekingenten – Entenrasse im Blickfeld 2004 (in German). Sonderverein der Entenzüchter Deutschlands von 1895. Accessed April 2017. ^ a b c d e Carol Ekarius (2007). Storey's Illustrated Guide to Poultry Breeds. North Adams, Massachusetts: Storey Publishing. ISBN 9781580176675.